For so long I had the cousin relationships all wrong. I had heard of this cousin 1st removed thing, but never really knew what it meant. It is really not a complicated thing, but most people don't use it in general conversation. Since I am working on my family's history and the vast number of people that are connected, it is important for me to understand the exact relationships between them. It is still quite awkward to say, because it doesn't seem to roll off the tongue to easily, but it is what it is and I want everyone to know and understand how these relationships actually work. First Cousins - are those that have the same grandparents. Second Cousin - those who have the same great grandparents but not necessarily the same grandparents. Third, Fourth, Fifth Cousins - 3rd cousins have the same great-great grandparents; 4th cousins have the same great-great-great grandparents,; and so on. 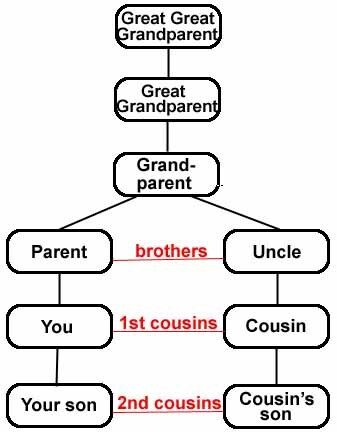 For example; your mothers first cousin is in the same generation as your mother, but one generation from you, so that means that your mother's first cousin is your first cousin once removed. 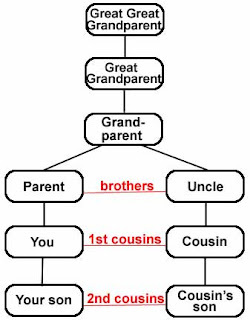 Your mother's first cousin is your child's first cousin twice removed, because they are two generations from your mother and her first cousin. Pick two people in your family and figure out wich ancestor they have in common and their relationship each have two that ancestor. Look across the top of the chart to find the first person's relationship to the common ancestor. Look at the far left column to find the 2nd person's relationship to the common ancestor. Going across and down you will find where the two rows meet, this gives you the relationship of these two people.